Fastest qualifier Up Hill Jill will go in to Saturday's Group 1, Ladbrokes Golden Easter Egg final as race favourite after drawing box two in the $250,000 to the winner 520m event. The home bred daughter of Premier Fantasy x Where's Demonica, won the opening semi final on Saturday night, April 8, in 29.63. The most impressive part of Up Hill Jill's run being her blistering 5.36 first section. "We are just over the moon," Geall said post race. "We raced the mother, Where's Demonica who also had early pace. "Up Hill Jill has taken to Wentworth Park, having run second in the National Futurity back in February, but this is the next step. "We are happy with the draw," Geall added. "It will be down to Jill now to start like she has been, but it would be a dream come true to take out a race like the Golden Easter Egg." Yass based trainer, Neil Staines, will also have his first ever Ladbrokes Golden Easter Egg with Slamming Thunder finishing strongly behind Up Hill Jill in the opening semi-final. "We are just wrapped mate," Staines said. "He ran home very well, especially with a strong dog like Nangar Bear on his tail." Winner of the 2017 National Futurity, Striker Light, continued her love affair with Wentworth Park, taking the second semi final in 29.64 over Lagoon Jazzy. "She'll be in it, but it will be tougher to get across from the seven in the final," trainer Brett Brave said after the box draw. Early speed continued to be the theme of the night, in semi final three, with Mack Tux holding out Big Flood. 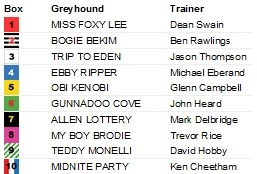 The NSW son of Lochinvar Marlow x Oxley Falcon has drawn box one in Saturday's final, and will give his connections an absolute thrill. The final semi of the night was a tight fought affair, with Aqua Cheetah pipping Lucky Chap on the line, giving Victorian trainer Seona Thompson two qualifiers in the 2017 Ladbrokes Golden Easter Egg. Qualifiers of the 2017 Golden Easter Egg consolation, The Ambrosoli, are also listed below, with box draw to be conducted on Tuesday, April 11. The Ladbrokes Golden Easter Egg semi finals were supported by the running of the Group 1 Association Cup stayers event. Two heats of the $75,000 to the winner series were conducted on Saturday night, with interstate runners dominating. The opening heat went the way of South Australian, Bogie Bekim, trained by Ben Rawlings. Chasing down early leader Teddy Monelli, and taking up the lead at the home turn, Bogie Bekim took the opening heat in 41.96. A host of NSW runners rattling home, including Ebby Ripper, Miss Foxy Lee and Gunnadoo Cove. Hot after setting a track record at Traralgon, Trip To Eden took the second Association Cup heat in 42.22 over Allen Lottery, Obi Kenobi and My Boy Brodie.